Tanti here. 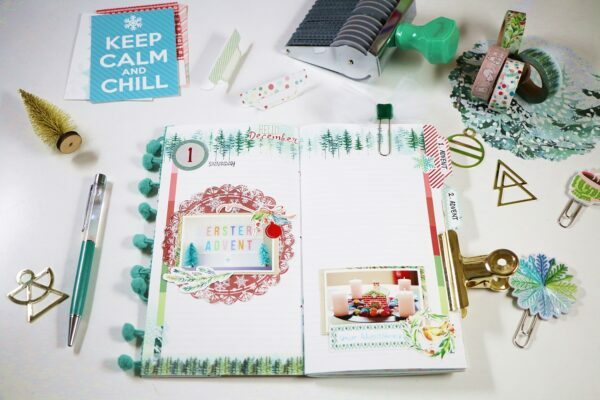 Today I‘m sharing some pages of my December Daily in the standard size Daisy Dori planner. 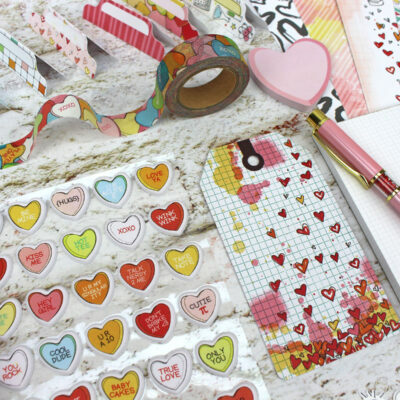 I must say that I‘m a bit behind with it but I just want to give you some ideas on how you can use some items from the kit to decorate your pages. I really love using the standard size dori to document everything about my family. I have enough space to write my stories and to add photos at the same time. 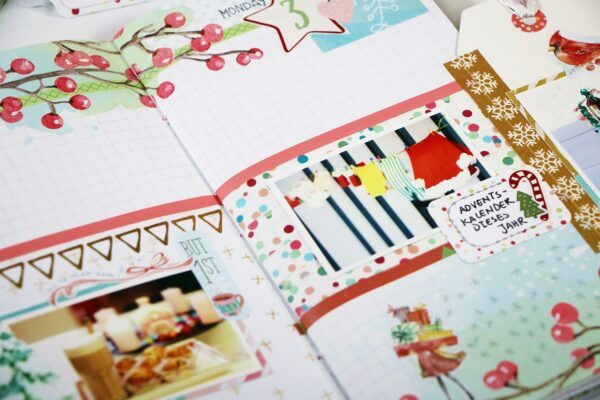 Even if I sometimes don‘t have much story to write, I can just create a Scrapbook spread in it. This size is really versatile. This month, I did it a little bit different. Before I filled in the dori, I took off all the staples from the spine. 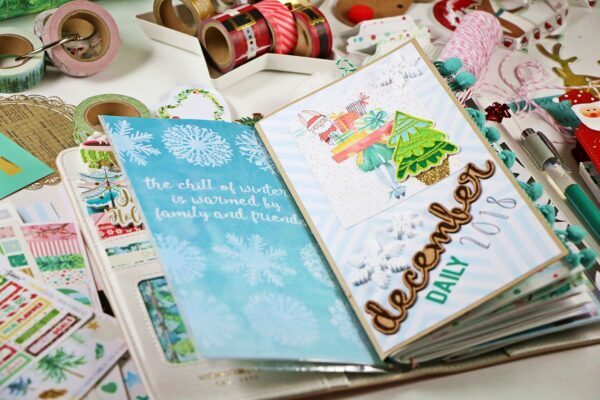 Because I would love to add more pages in different sizes and materials to the booklet. Let’s take a look at the pages. On the first spread I used one of the doilies to mat my photo. 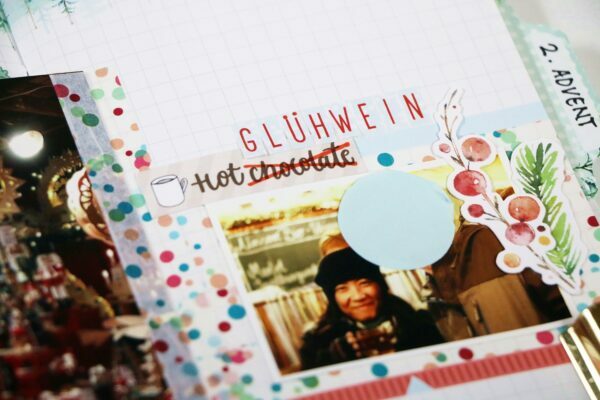 On the left side of the spread below, I covered up a part of the page with a piece of patterned paper from the kit. 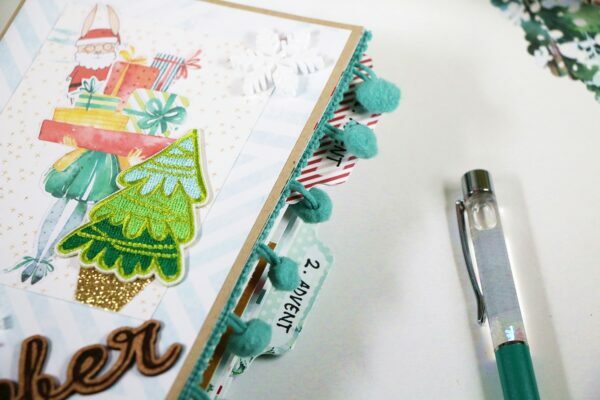 I also attached the tag that came with the kit to the page using washi tape. On the other side, I just covered up a part of the page with washi tape and used it as a photo mat. On the two pictures below, I added the big doily between the pages. Then I attached two photos onto the doily by gluing them back to back. 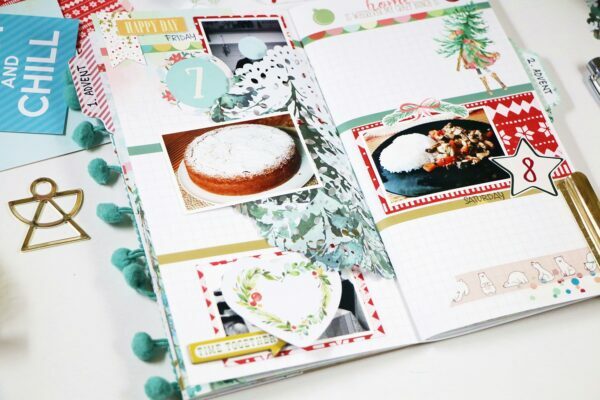 The next spread, I had more photos on that day but I didn’t want to glue them on extra pages. 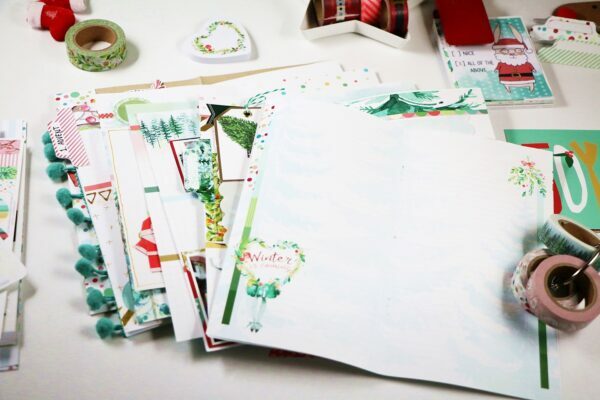 So, I just glued them back to back and attached them to the page using washi tape. I also attached one of the tabs to the photo to make it easier to flip over. 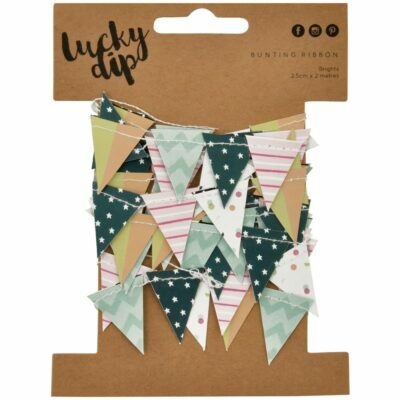 If you find some die cuts that don‘t fit to your photo, you can nevertheless use them. For example, the die cut that you see on the picture below is not quite right for my photo. I didn’t drink hot chocolate there on the picture but a cup of hot mulled wine. I just crossed out that chocolate word with a red Sharpie marker and added the right word using the mini alpha sticker from the kit. 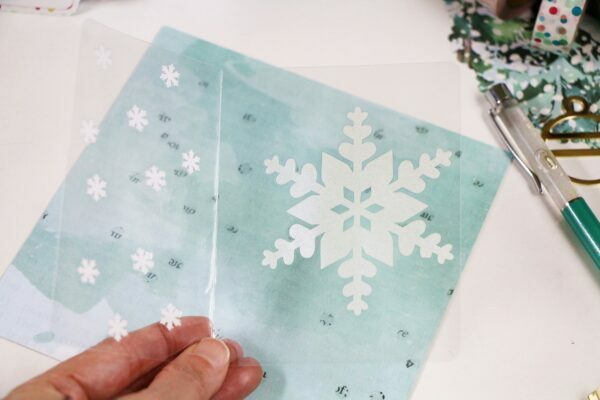 This is how I used one of the vellum snowflakes from the MK pocket kit. I laminated it just as shown on the picture below. To fill in the blank space of the foil, I punched some mini snowflakes out of cardstock and put them in. I then attached it to the booklet as shown on the picture below. 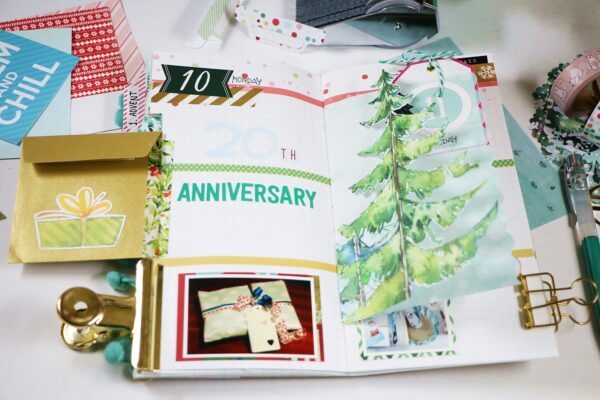 On the next spread, I folded the vellum from the planner classified kit in half and attached it to the spread. I also fussy cut the tree from one of the patterned papers and sewed it on the vellum, just to make an interesting look to the page. On the left side, I attached a mini envelope from my stash to hide my journal. 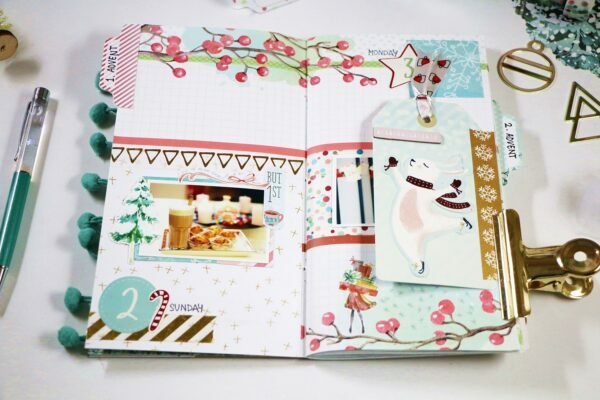 I love adding a cute bits and pieces to my journal. 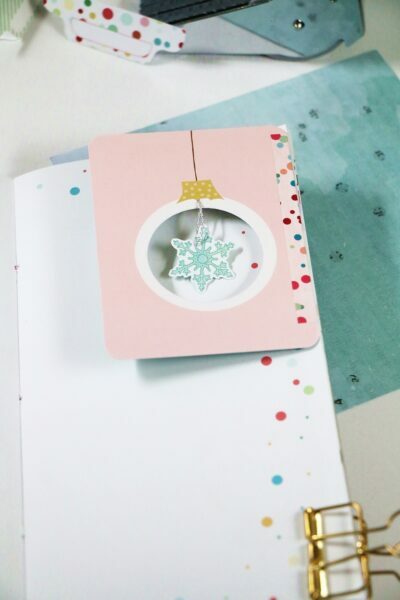 On the picture below I punched out the Christmas ornament that was printed on one of the journaling card from the MK pocket kit and attached a snowflake to the hole. That snowflake consists of two stickers that I glued back to back. I used the tabs to mark the advent weeks. 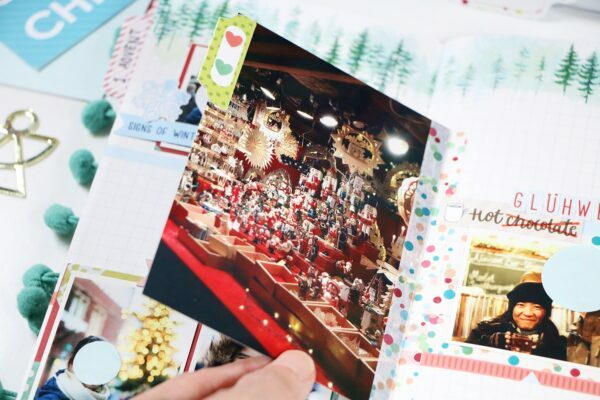 On the blank spaces, I will write my journal after I glue all the photos into the booklet. Well. That’s it for today. 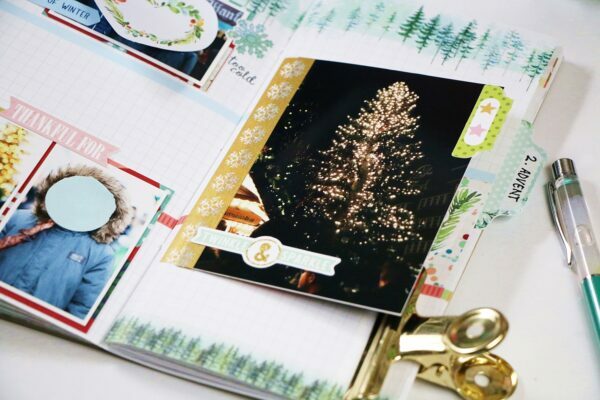 I hope I could give you some ideas on how to use your kit to document your December. If you have any questions, you are welcome to write them here in the comment section, on my Instagram or in the Facebook group. Thank you so much for stopping by and see you next time. I just want to let you know how much I love watching your videos and reading your blog posts. As much as I love CD planner kits, I just had not found my groove (I’ve experimented with the A5, B6 and Standard Dori sizes). 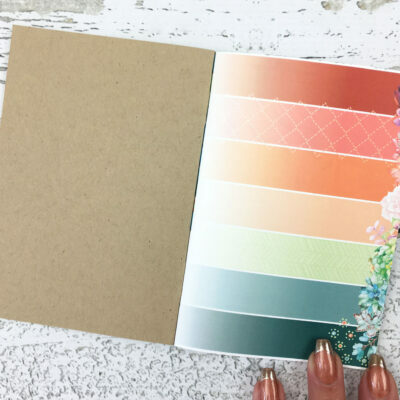 However, seeing how you work with the Standard Dori size made me realize how I can adapt the pages to more closely match the Moleskine 5″x8.25″ Bullet Journals I’ve used for years. 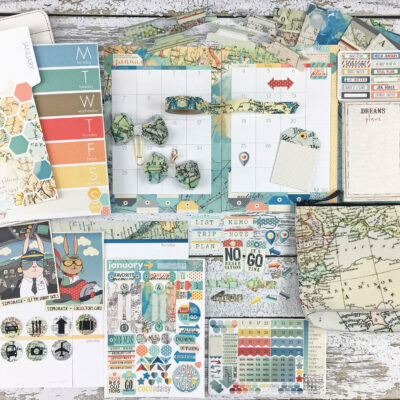 I am so excited that I can now use and play with a beautiful CD planner size I’m fully comfortable with. Thank you so much for all the sharing you do! Thank you so much for your feedback. I really appreciate it. I’m glad that you liked my works and I’m also gald to hear that they also useful for you. Thank you again.